It’s almost time for summer break and we’re anxiously counting down the last few days until summer! And the best part of summer is lazy days by the pool and very little effort put forth in the kitchen. That means I want recipes that are simple, easy, light and healthy and, of course, amazingly delicious. Summer Green Bean Salad is perfect. It’s light and healthy, but simple and easy and oh-so-delicious. 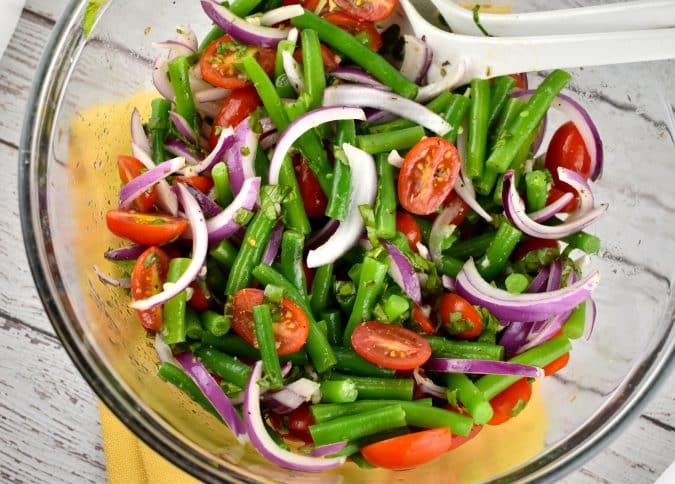 Bright and fresh green beans with juicy tomatoes, crisp onions and a tangy lemon garlic dressing that is incredibly tasty. Some people really like to cook their green beans until they’re limp as dishcloths. I don’t. I like it when my green beans are just a little crisp. To keep them just a little crisp, I blanch them in boiling water for a few minutes, usually about 3 minutes, and then immediately put them into an ice bath. The beans will continue to cook, and get overcooked, if I don’t immediately cool them. If you prefer, you could steam them on the stove, or in the microwave. Just like with any salad, what really takes this salad over the top is the tangy lemon garlic dressing. It is the perfect complement to the salad that ties all the ingredients together into a mouthwatering combination. The dressing is so simple, and one of the things that I really love about it is that I don’t have to whisk it together beforehand. Just combine all the ingredients in a bowl and it’s ready! Now, if it’s a little later in the summer, you might have fresh garden green beans to make this with. There is nothing better than fresh garden green beans in this. And, if you’re looking to have a relaxing afternoon, enlist the kids’ help in snapping those green beans on the back porch with some of your favorite snacks! Regardless of whether the green beans come from your garden, the farmers market or the grocery store, this salad will be a sure hit. We usually end up eating most or all of this salad the first night – it’s just so good. But, if you’re lucky to have some left over, don’t worry. Usually, salads get gross in the fridge overnight. The greens get limp and soggy and everything is just unappealing. But, since this salad is made with fresh, crisp veggies, it’s just as good the next day. Summer Green Bean Salad is perfect for a lazy summer day. It’s a great side dish to add to your meal since it’s so bright and refreshing. It’s quick and easy to toss together and so appealing that it’s sure to be a hit. It’s ready in less than 20 minutes and will be gobbled down in far less than that. I love to bring this salad to potlucks, poolside parties, summer BBQs, and 4th of July picnics. It’s not only light and healthy, but it’s unique. I can almost always guarantee that it’ll be one of the only green bean salads and is always a crowd pleaser. There is absolutely nothing better than this refreshing, cool and delicious Summer Green Bean Salad. It’s low in points with only a few ingredients and a little prep time. But it packs a nutritional kick that’s only topped by the amazing flavors that you’ll fall in love with. An easy and delicious low carb salad that’s perfect for your summer get togethers! Fresh, cool, and crisp it’s everything you want to eat on a hot summer day. Bring a pot of water to a boil. Blanch green beans in water for about 3 minutes. Drain and transfer to an ice bath for another 2-3 minutes. Drain and place green beans in a large bowl. Add in remaining ingredients, and toss well. Made this with fresh asparagus, as that was all I had and it was excellent. Thank you for a great recipe. I like your recipes but I don’t like your ‘print friendly’ option. It only shows the first page of a recipe, usually a picture and the description… this occurs each time I’ve tried to use that option. I have to copy/paste the recipe into a document. Please address this. Thank you. How disappointing that you only get the picture and dialog, but not the recipe when you select “printer friendly”! !